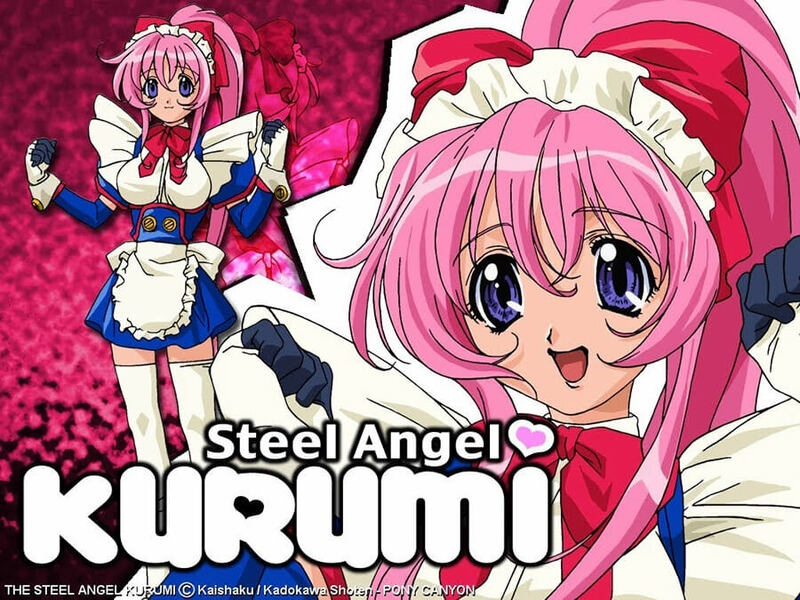 Kurumi is one of my all-time favourite characters, from one of my favourite manga authors, Kaishaku. Her design is so cute and colourful! 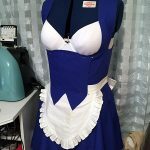 I have made this costume twice – the first costume made in 2010 was based on her outfit in the original Steel Angel Kurumi anime, made mostly from cotton. It was quite badly fitted and uncomfortable. This version has been retired. 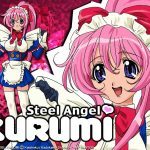 The updated version made in 2017 is based on the manga variant introduced from Volume 6 onwards and from Steel Angel Kurumi 2-Shiki. It’s not accurate to a single piece of artwork or “version”, but instead uses my favourite aspects from various different designs. This version is much more comfortable to wear! These notes refer to the version made in 2017. 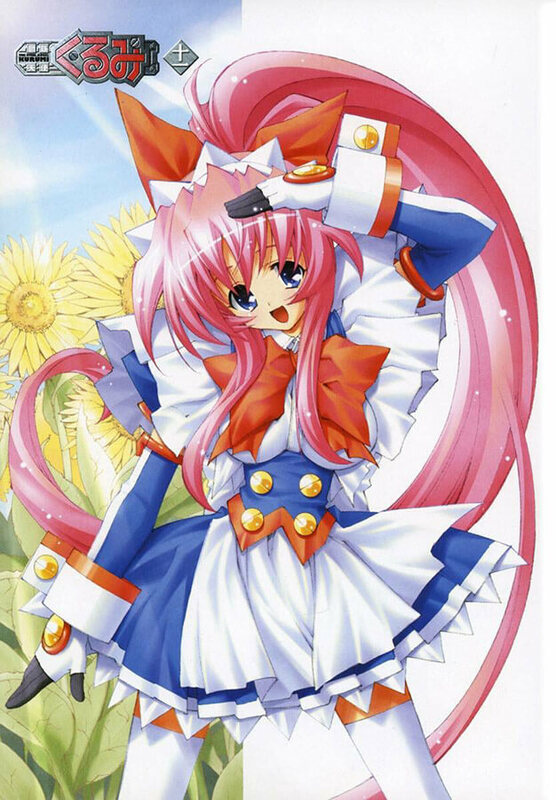 Kurumi’s design is quite simple, but there are lots of pieces that fit together that made it tricky to plan. 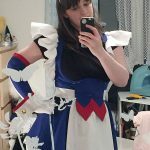 I spent a long time planning this costume! For the remake, my goal was to be happy with the result – along the way I found part of that was sacrificing “accuracy”. This series is old and inconsistent especially in the manga – my favourite telling of the series, and the one I wanted to follow most. 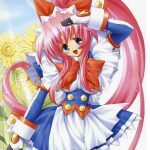 Instead, I chose elements I liked from various pieces of artwork and made my own “version” of Kurumi – it still looks like her, it just doesn’t fit a single piece of artwork. 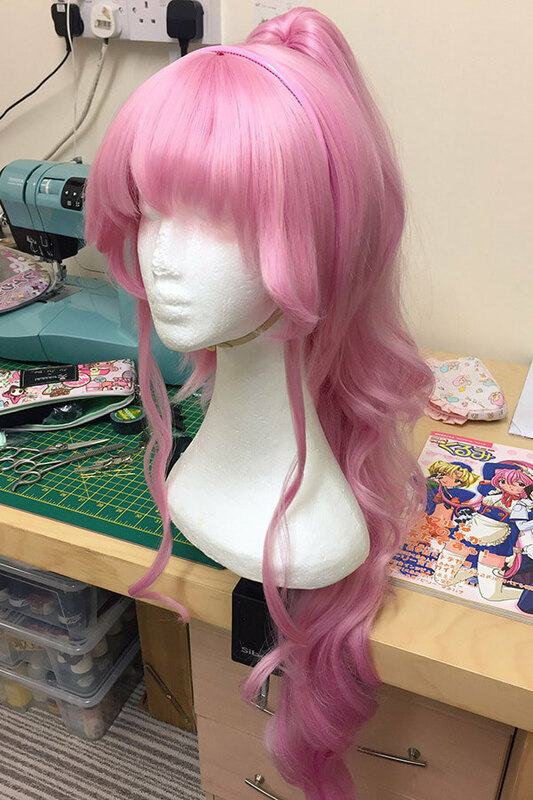 The wig is a Lulu & Long Curly Clip in Baby Pink from Arda Wigs. I decided to use a short wig and a clip instead of a “ponytail wig” for comfort when wearing the costume. 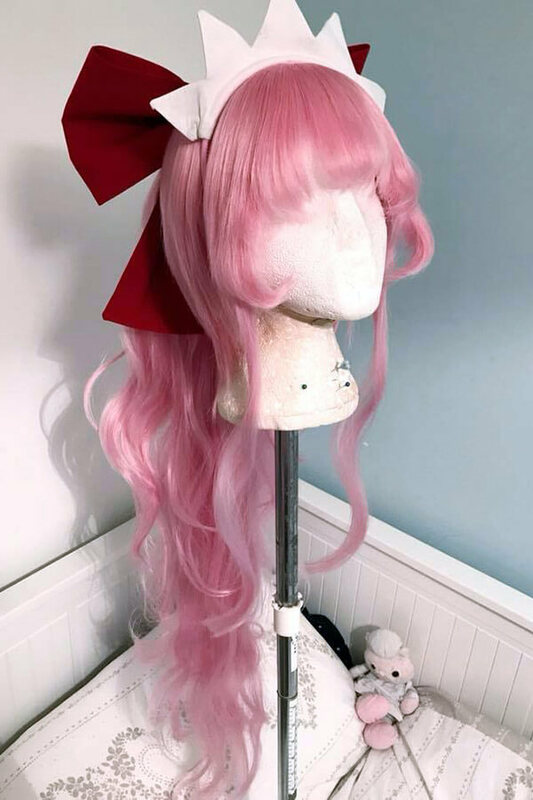 I bought a curled clip instead of a straight one to add extra volume; her hair is meant to be straight, but I think it looks much nicer in real life with a bit of bounce! The curls were loosened with a brush and heat, and the inside of the clip is backcombed with hairspray to create more volume. 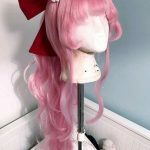 The hair frill is attached to a pink hairband matching the wig. It is supported with two layers of cotton sateen, interfacing and starch. The hair bow is made from red polyester, thin batting and interfacing, designed to sit on top of the clip in ponytail. 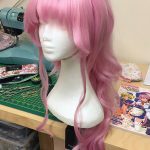 It slides into the wig using hairpins. 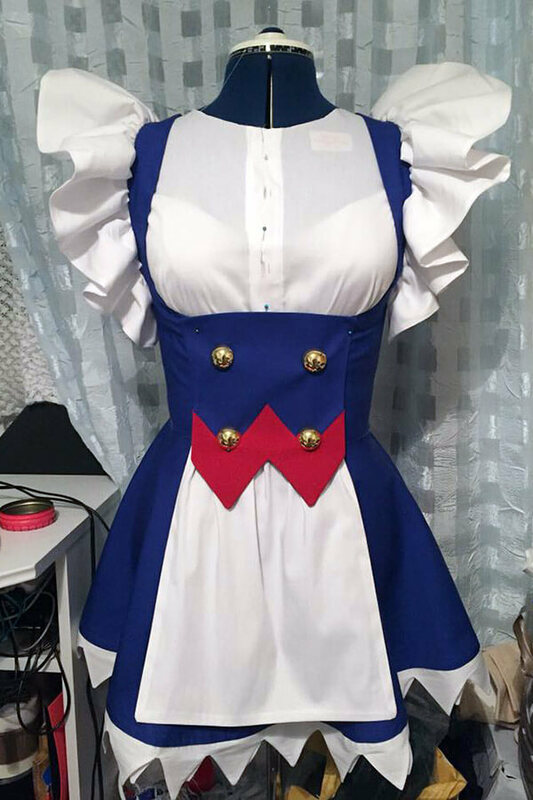 The blouse is made from white cotton sateen with the blue puff sleeves made from drill attached to it. 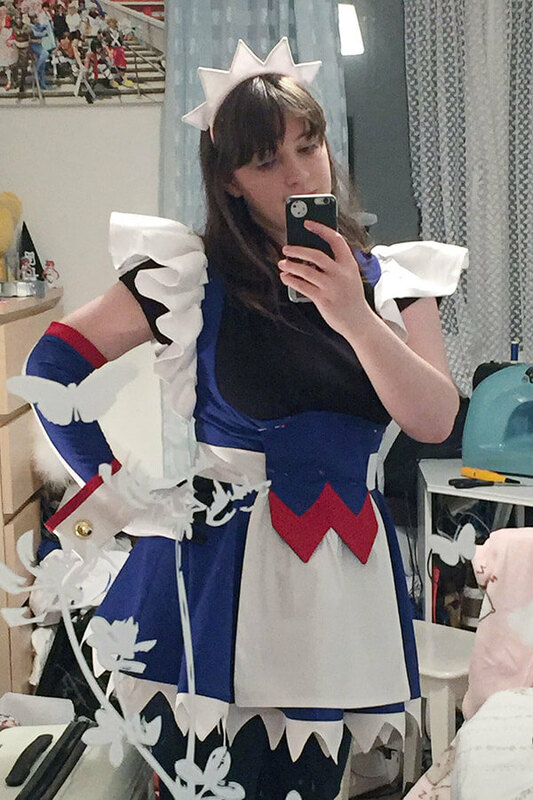 The shoulders are approximately 1cm wider than I’d usually pattern, to allow the straps of the dress to sit smoothly and not crush the sleeve underneath. There are snap fasteners fitted at the collar to attach the neck bow. The front closes with a button band. The dress is made from the same blue drill. It is all one piece, but has three parts – the straps, the skirt, and the frills. 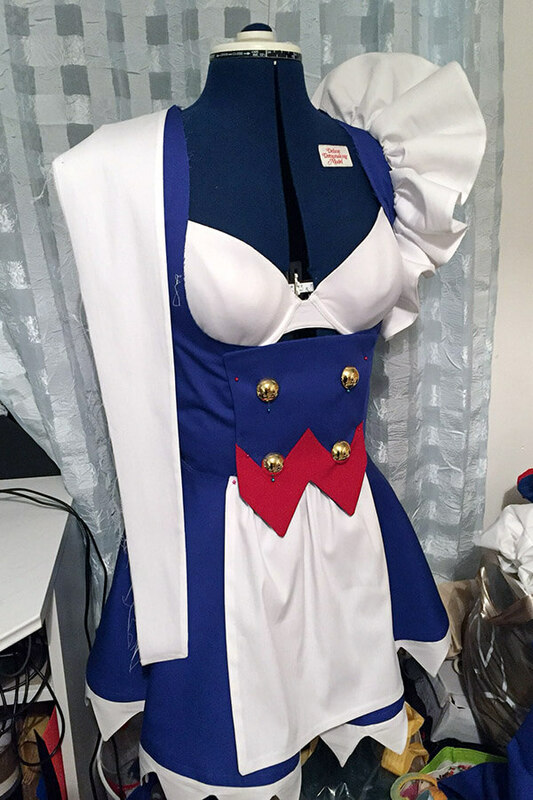 The straps are all in one piece and are attached to a short bodice of sorts, patterned to help frame the bust. The frills are long curved strips of cotton sateen, interfaced and sewn inside the straps – this means they always look in perfect proportion when worn and the frills don’t get squashed. 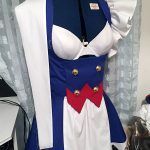 The skirt of the dress is attached to the bottom of the waist panel and there is a zipper down the centre front, minimising the visible seams on the costume. The edge is finished with a white pointed trim. Each point was drawn and cut by hand, stitched and clipped then ironed flat. It’s a time consuming process, but I love the look of the clean pointed edge! On top of the short bodice piece there is a small pointed panel attached with snap fasteners which hides the zipper, with red applique at the bottom and gold buttons. The panel is interfaced to reduce crinkling when worn. 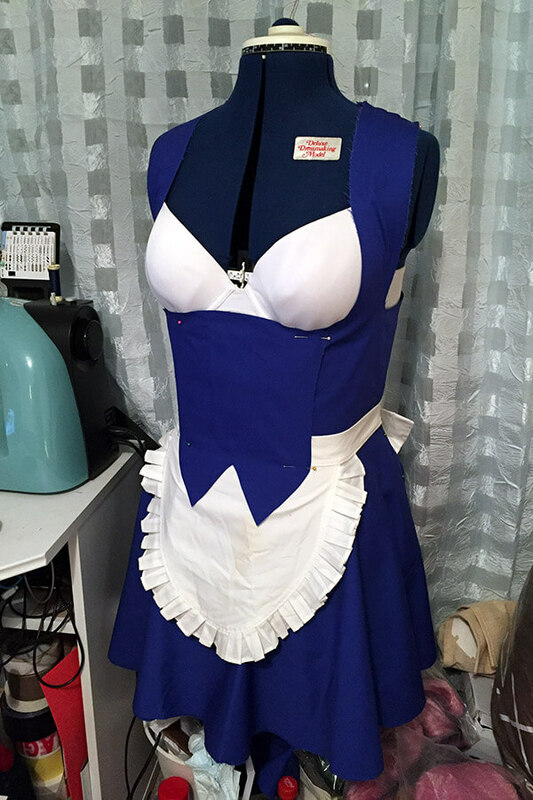 The apron is made from the same white cotton sateen. It is a simple waistband closed with snap fasteners at the back underneath the bow. The front apron itself is a small gathered rectangle to match the manga design. The sleeves and gloves are made in three parts – the first one is the blue and white two-tone sleeve, edged in red with a black glove attached at the wrist. This pulls on as one piece to reduce movement when worn (and bulky seams)! The white panel is made from scuba jersey, so they can pull on without any fastenings. On top of the black gloves, I wear a small pair of white fingerless gloves (also made from scuba jersey). The cuffs finish off the gloves. 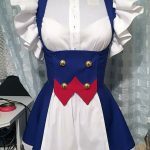 These are are made from cotton sateen to match the rest of the costume (and to give them better body) with red polyester trims and gold buttons. There are two sets of snap fasteners hidden inside so they fit to my wrists comfortably and are easily removable. The socks are plain white over the knee socks. The shoes at the moment are inaccurate, but I do plan to make some accurate shoes for Kurumi in the future!